In the first book, Gregor the Overlander, our eleven year-old hero literally fell down into a world where he is predicted to be a ‘warrior’ in a prophecy. In the land underneath New York, Gregor made new friends among Regalia city’s royalty, army, and creatures that live among them. He is forced to go on a quest to fulfill a prophecy that will save the world, and the successful quest also led Gregor and his sister, Boots, to find their missing father. In Gregory and the Prophecy of Bane, a few months have passed since they returned to Overland and tried to fix their normal life back in NY. Gregor is still haunted by the second prophecy mentioned in passing before he left. It was almost Christmastime, and one snowy day, Gregor goes sledding with Boots in Central Park. Preoccupied with his thoughts on how to save up money to provide for their Christmas celebration, Boots disappears and Gregor is forced to go back to Underland to find her. GNAWERS HAVE THEIR KEY TO POWER. Terror gripped Gregor’s heart as the last stanza of this second prophecy seemed to be straightforward in its message, and it eerily pertained and coincided with Boots’ disappearance. Little Boots, he learned eventually, was safe with her roach friends (yes, as in cockroach), and Gregor is coerced into a military training with the young Regalia people to get ready for war. In his previous quest, Gregor could only acknowledge luck as the aspect that made him survive. This time, he discovers that he’s a ‘rager’, an instinctive killing-machine mode with his sword that he has to learn how to control when in the zone. This newfound skill gives him a bit of confidence, but the magnitude of what he needs to accomplish is still daunting. He should be the one to single-handedly kill the Bane, a white rat in Regalian history said to be the most powerful creature in the Underlands. This second quest compelled them to crack this new prophecy and navigate the treacherous Waterway where they fought vicious creatures along the way. Destination? The Labyrinth, which is obviously a land of mazes, but they barely made it alive after their perilous battles. When they got to the maze, they discovered that the mythical Bane is real, but he’s just a baby. Gregor’s moral fiber was tested on what to do, and their quest concluded with an unfortunate banishment when they got back to Regalia. This sequel explains in length the after-effects of Gregor’s new role in life. He’s getting tired and worried about the family’s daily household expenses, and his ‘warrior’ hat is something he still rejects. There is still disbelief and awe of his new destiny, but it is dawning on him that he has to do these things. A lot of Gregor’s emotional turmoil can be felt, on top of the wild trance-like state that he’s still trying to contain. His skirmishes with the creatures will leave readers breathless, but one will also feel that his soul is more worn out by additional losses to his crew in this second precarious journey, especially since his friend and crush, Luxa (the Regalian queen), went missing and was presumed to be dead. It’s a cliffhanger ending, and the fate of the missing crew members are yet to be known in Gregor and the Curse of the Warmbloods. Suzanne Collins takes her readers into an action-packed second quest, but pulls hard on heartstrings as the endearing characters face some tragic sacrifices for friendship, for nationalism, for family, and for love of all breathing creatures. The review on Gregor and the Curse of the Warmbloods is coming soon! Was scouting for books to gift my sister with when my eyes scanned the Young Adult section and found Suzanne Collins. Suzanne Collins! I was wondering what other books she wrote aside from the now famous The Hunger Games trilogy, and there on the shelves were five books of the Underland Chronicles. By just looking at the format of the paperback, my hope was that it was an enjoyable book for young ones, in contrast to the dark and heavy dystopian views of the world in her more famous novels. After reading this one, heck, I found a gem! The story started with a bored 11 year-old named Gregor who was on autopilot mode with his daily household responsibilities. One will quickly learn that Gregor’s the ‘man of the house’ ever since his Dad disappeared two years from the start of the story. Gregor loved his family enough to willingly take over, yet can’t erase the feeling that something was missing because he grew up too soon. He was distractedly playing catch-the-ball with Boots, his adorable 2 year- old sister, when she suddenly fell silent. Gregor went to the laundry area where he last threw the ball and found Boots staring at the open metal grate covering an old air chute. She found something really interesting in the hole, leaned forward, and fell. To Gregor’s panic, he jumped in and followed her…and this was how things became interesting. After page 5, I immediately fell in love with Margaret (but more commonly called Boots), who was baby talking in print! Gregor’s fall into the hole reminded me of similar plots: The Doomspell Trilogy by Cliff Mcnish and Neverwhere by Neil Gaiman. I learned at the bonus stuff at the end of this book that Collins was also thinking of a modern-day, male version of Lewis Caroll’s Alice in Wonderland. Gregor’s ‘overland’ was New York City, and his ‘underland’ was Regalia, a city where humans thought sunlight was a dream and where people were as white as milk, had purple irises, and silver hair. Being the underland that it is, readers will come metaphorically face-to-face with overland’s much avoided critters: roaches, rats, spiders, and bats. Collins brought them to life, gave them such interesting personalities they almost seemed loveable (and by now, the ambivalence over their anthropomorphism would be ‘killing’ anyone with icky-ness). How humans & animals are thrown together in a team to fulfill a prophecy is almost impossible to derive without a whole lot of mental objections spurting from our minds, but with a lot of suspended belief, this narrative is as funny, exciting, and brilliant as any pop culture literary reference of a hero (Percy Jackson and Harry Potter). Gregor is prophesied as a ‘warrior’ from above, and like all other reluctant heroes coming-of-age, his moral fiber and values are tested to its limits in decisions of life or death. He literally falls into chaos, and is expected to solve the history of a people he never knew existed. Pre-destination is the curse for such chosen ones, but in the end, the ‘leap’ that he did made all the difference. Jolted, but changed, and after losses incurred from his quest, Gregor’s maturity hitched up a notch. He is a fiercely responsible brother to the very very cute Boots, and at the end of the story, a good, pure-hearted boy who tried to trust the universe and jumped into the unknown. I’m glad that I bought the next book and finished it in a day! Can’t wait to buy the last three books of the series (and here’s hoping they’re still in stock). I can bet my bottom dollar that after reading this book, you may actually hesitate for a split second about killing the cockroaches and rats that invade your home. 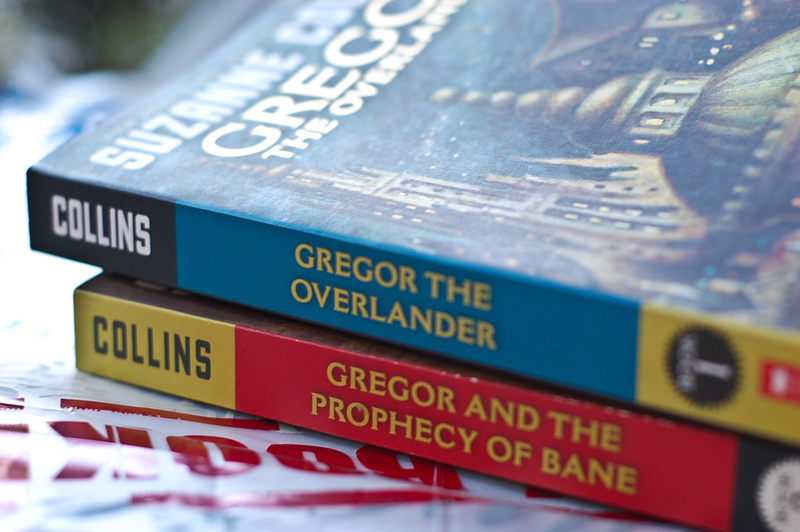 I’ll review Gregor and the Prophecy of Bane next! If you’ve been wondering where The Lost Hero went, well, here he is, back in the game of fighting beasts and gods in The Son of Neptune, the second book in The Heroes of Olympus series. Amnesia-riddled protagonists seem to be a fairly common trope in recent contemporary literature, and avid readers of the series probably started rolling their eyes at Percy Jackson’s ‘cluelessness’ of his identity in the opening chapters. Percy relied much on muscle memory to stay alive against the creatures chasing him in his waking hours…and in his dreams only remembering Annabeth (yes, the heart really can’t forget). Divine intervention makes him stumble upon a new camp, and this discovery prompts readers to understand where Rick Riordan’s big reveal is heading. Percy sought refuge in Camp Jupiter, a ROMAN camp. Ta-dah! The purpose of the Greek/Roman hero mix-up still seemed vague in the The Lost Hero (with Jason, Leo, and Piper), but Percy’s alliance with Hazel and Frank pretty much declares the parallels of the narratives. It is mighty fun to actually have a written account of how Roman armies are presumed to work, and this time, Riordan expanded this horizon by making us glimpse of a microcosm of a Roman city in existence. Camp Half-Blood of the Greeks begins to seem like a delinquent school for boys & girls in retrospect, whereas Camp Jupiter is part of a bigger community not just of young demigods in training, but of adult ones who’ve settled down, explored a normal life and grew old. It was a view of a future that Percy had never imagined, and which he is now hungrily desiring, but saving the world at present and successfully doing so is the harsh pin popping his bubble. In the meantime, we are introduced to new vital characters, Hazel & Frank, whose lineage and potential bring much of the color and mystery in Percy’s journey with them. Their powers are much more pronounced than any other characters you’ve met in this saga, but it is also twin to the depth of anguish displayed in every painful choice they make to save their camp and each other. Hazel and Frank’s every step really IS a matter of LIFE or DEATH. You’ll know soon enough why, if you read the book. Somehow, one begins to think that these two lovebirds actually eclipse Percy is some daring moments, and it is good to see that their characters are built up solidly to emphasize their importance in the future quests. After all, a daughter of Pluto and a son of Mars should have intense tricks up their game. It is an adventure you really shouldn’t miss again, as lovable new sidekicks appear to help in their hair-raising battles. 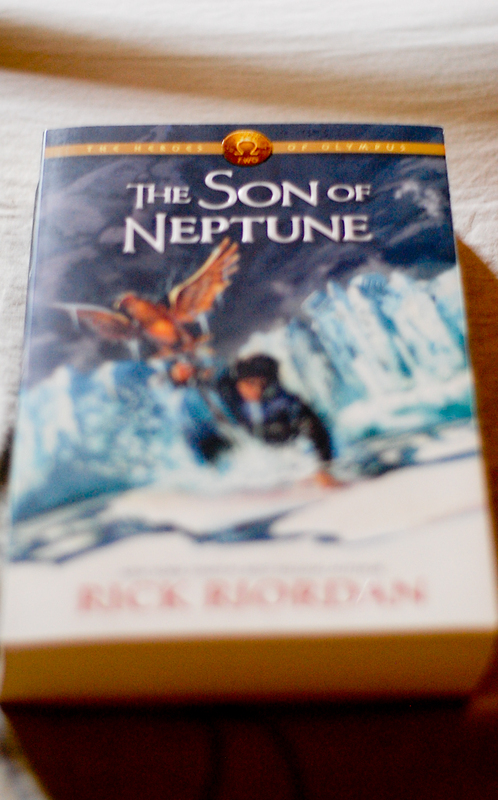 You’re up for some much-awaited ‘reunions’, and you will certainly begin to see that Riordan’s skillful intertwining of Greek & Roman histories are headed for a very exciting, epic journey. Grab a copy, NOW.